On March 6, 2012, the FDA warned consumers not to use skin creams, beauty and antiseptic soaps, and lotions that might contain mercury. We know we're supposed to be cautious with some types of fish, particularly during pregnancy. Marlin, orange roughy, swordfish, shark, mackerel, and Ahi tuna can all be high in mercury, and thus we're advised not to eat them too often. But since when have we had to worry about mercury in our personal care products? It's really close to your eyes—is it safe? Mercury occurs naturally in the environment, and is also known as quicksilver. A heavy metal like lead or cadmium, it exists in different chemical forms, and is the only metal that is liquid at standard temperature and pressure. Today, we use it in thermometers, barometers, float valves, fluorescent lights, and other devices as well as in material for dental restoration. Mercury and most of its compounds are extremely toxic. It can be inhaled and absorbed through the skin and mucous membranes—that's why containers are sealed to avoid spills and evaporation. Elevated exposure can harm the nervous system and the brain, as well as affect the developing child's ability to learn and process information. According to the FDA, certain products may contain mercury. These include skin lighteners and anti-aging treatments that remove age spots, freckles, blemishes, and wrinkles. Products with mercury have been found in at least seven states, and include brands like Diana, Stillman's, Lusco, and Crema Aguamary. The products are manufactured abroad and sold illegally in the U.S.—often in shops in Latino, Asian, African, or Middle Eastern neighborhoods and online. The FDA is warning consumers that if they have purchased products like these, to throw them out immediately. The FDA doesn't allow mercury in cosmetics, except under very specific conditions, which these products do not meet. Worse, you apparently don't have to use the product to be potentially affected. An FDA toxicologist named Mike Bolger, Ph.D., says that people, particularly children, can get mercury into their bodies from breathing in mercury vapors if a member of the household uses a skin cream containing mercury. Smaller children can also ingest it if they touch others who have used these products. The World Health Organization (WHO) also warned about mercury in cosmetics, including skin lightening soaps, creams, and cosmetics like eye makeup, cleansing products and mascara. Apparently the mercury salts inhibit the formation of melanin, resulting in a lighter tone, which makes these products especially popular among dark-skinned populations. The organization stated that serious adverse effects of inorganic mercury, which is a common ingredient in skin lightening soaps and creams, includes a reduction in the skin's resistance to bacterial and fungal infections. The WHO also added that mercury in these products is eventually discharged into wastewater, where it then enters the environment and the food chain. You may be surprised to learn that the FDA does allow mercury compounds in eye area cosmetics at concentrations at or below 65 mg/kg. The ingredient is called “thimerosal” or “mercuric” and is about 49% mercury by weight. Used as an antiseptic and antifungal agent, mercury in these products protect the delicate eye area from bugs that may cause infection. With our current concerns about the metal, however, it seems this regulation is out of date. We have other options now for killing microbes, and we need to cut down on our overall mercury exposure. Like radiation, mercury can accumulate in the body over time, until a threshold is reached that results in symptoms of mercury poisoning. Fortunately, you can take steps to reduce your exposure to this potentially toxic metal. Most importantly, use only those products that you buy from a trusted source. If there is no label or no ingredients listed, don't use the product. 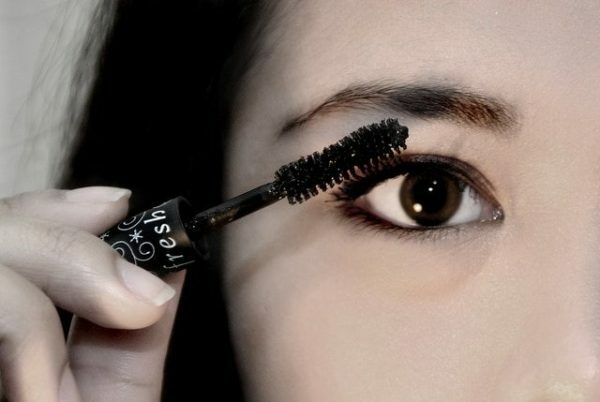 Choose mascaras and other eye products made by health-conscious companies. Do you have other tips for avoiding mercury exposure from personal care products? Please share. Photo courtesy angelicalalala via Flickr.com. “Mercury Poisoning Linked to Skin Products,” FDA, March 6, 2012, http://www.fda.gov/ForConsumers/ConsumerUpdates/ucm294849.htm. Kounteya Sinha, “WHO warns against mercury-laced cosmetics,” The Times of India, June 5, 2012, http://articles.timesofindia.indiatimes.com/2012-06-05/health/32055036_1_mercury-salts-creams-soaps.